We have all seen movies about the Wild West and the brave cowboys and we loved them. These movies were action packed and included a lot of gunfights. 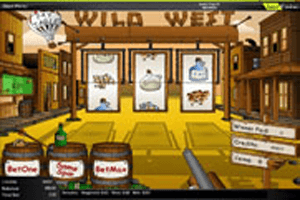 So if you wanted to be a part of the Wild West and enjoy the life of the cowboys and the way of the gun, then Wild West slot machine by Cryptologic is designed for you. It invites players to enter the world of the Cow Boys through the Wild West setting and interface of the game. Play Wild West Slots by Cryptologic. For starters, players will see a long rifle at the bottom of the slot machine that is pointed at the reels of the game. These reels are hanged from wooden planks that are located in the middle of the dirt street in an old desert town. On top of the reels, players will see the name of the game written with wooden planks as well. On the two sides of the reels, players will see large wooden buildings. The control panel of the game is also inspired by the theme of the game as the betting options and the spin button come in the form of beer barrels while the credits, coins and Winner Paid cells come written on top of wooden planks that resembles the ones giving directions. The paytable button comes in the form of a hot air balloon that is found hovering on top of the reels. The game has only got one payline that is found in the middle of the three reels of the slot machine. On the reels of the slot, players will see a bottle of rum, a bottle of wine, gold, a sheriff badge and other Wild West themed symbols. Players will be able to place the bets they want by clicking on Bet One to place 1 coin on the payline or Bet Max to place the maximum number of coins. There is also the credit value of the coin that players can choose which varies between 0.01 and 5. Although the game only has 3 reels and a single payline, it can be quite rewarding. Players can see how rewarding the slot machine is by opening the paytable of the game by clicking on the hot air balloon. They will see the different symbols and how much they will pay players when they appear matching on the payline of the slot. The highest paying icon of the machine is the sheriff badge icon as it can reward players up to 4000 coins when 3 of them land on the bet line. The Sheriff badge is also a special icon that acts as a wild and substitute for any of the other icons of the game. Not only that, as one badge will multiply the payout by 2x while two badges will multiply the payout by 4x. Of course, when three of them land on the payline, they will trigger the jackpot payout of the game which is equal 1000, 2000 or 4000 coins, depending in how many coins players placed in bets.